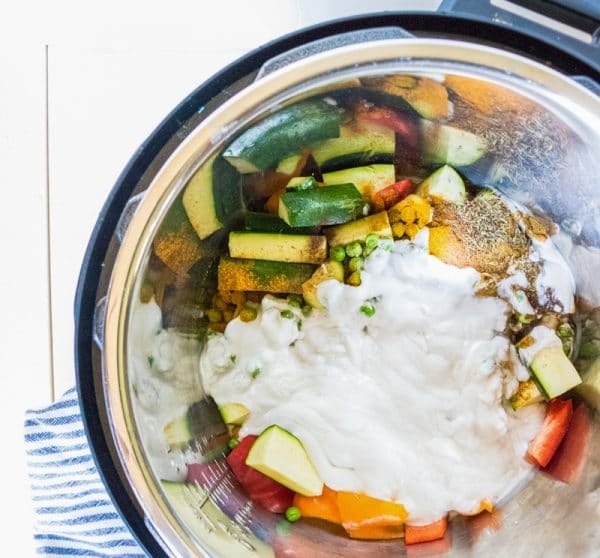 This instant pot vegetable curry is packed with Indian-inspired spices and loaded with fresh veggies. 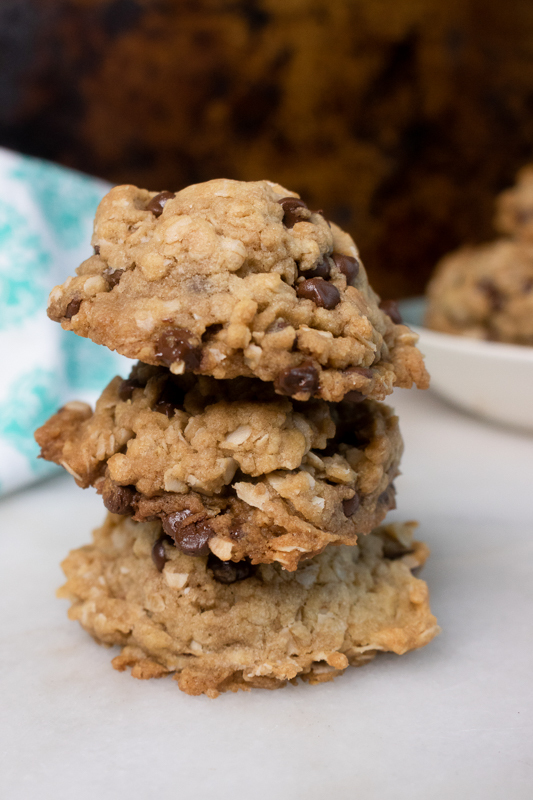 Plus, it’s completely vegan, gluten-free, and cooks up in less than 20 minutes! 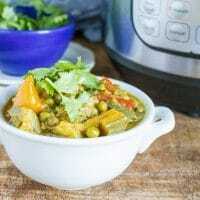 Most vegetable curry recipes take a minimum of an hour to prepare – and some can take hours to simmer on a hot stove. 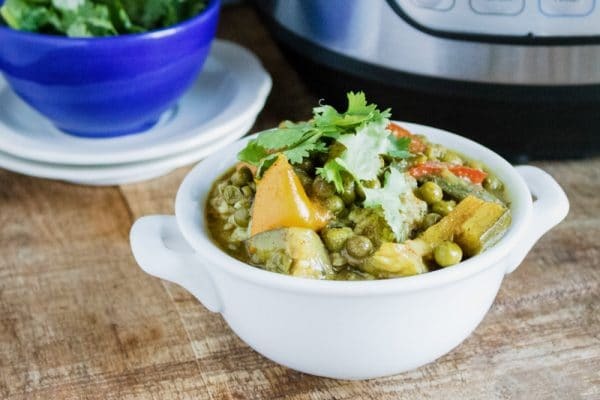 But this vegan vegetable curry is made in the Instant Pot, which means it will only take 20 minutes total. And that includes prep time! 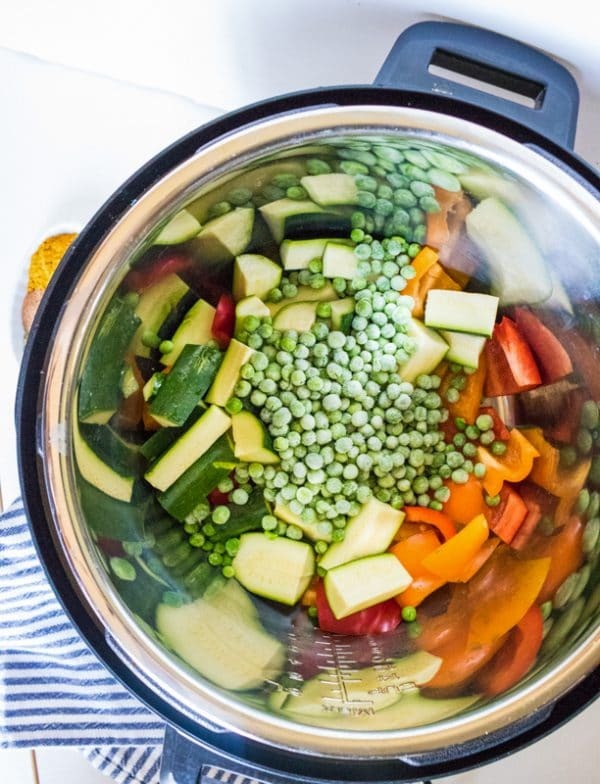 In takes just 10 minutes to prep all the veggies and spices, and another 10 minutes to cook in the instant pot. And I promise it will come out just as flavor as cooking the old fashioned way. You won’t even believe it’s 100% vegan! 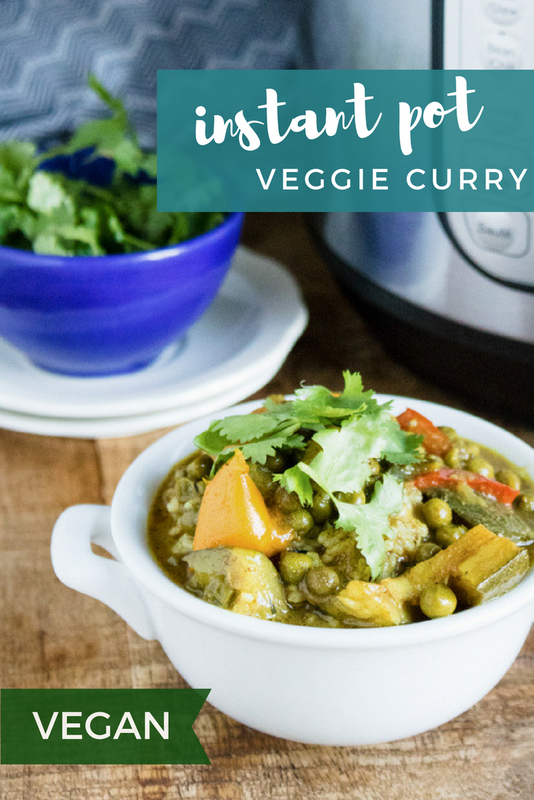 Let’s make vegetable curry in the instant pot! 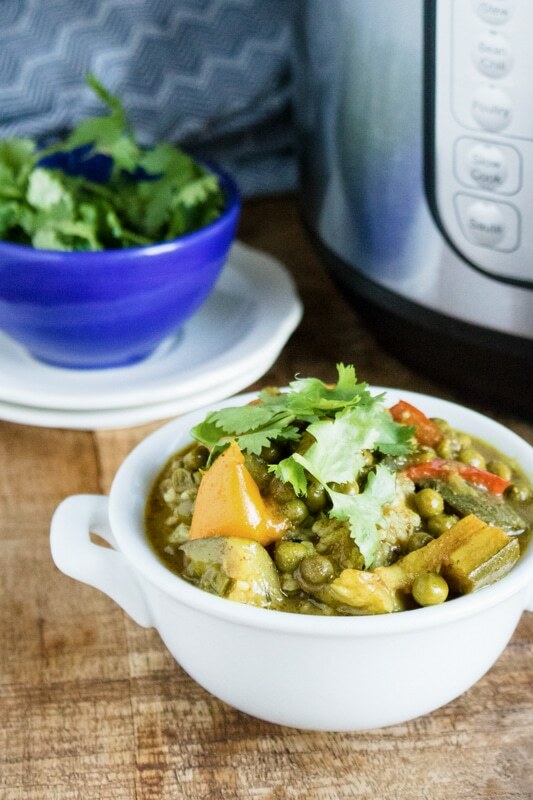 Like I said, this recipe is super simple, but I’ll share a few tips to make your vegan vegetable curry even tastier. Let’s start with the prep. Chop up your red and orange bell peppers. 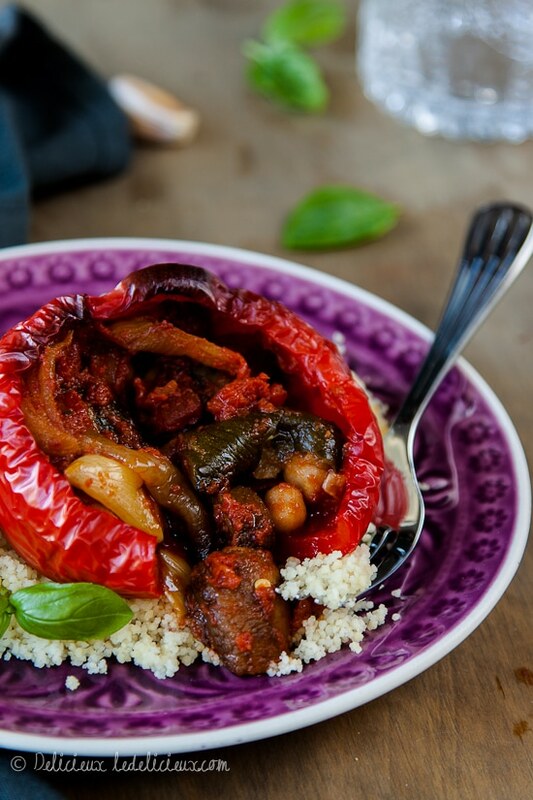 Did you know that red peppers are just a bit sweeter than the orange ones? So make sure you have both! 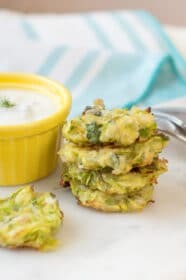 Chop us your zucchini into bite-sized cubes. 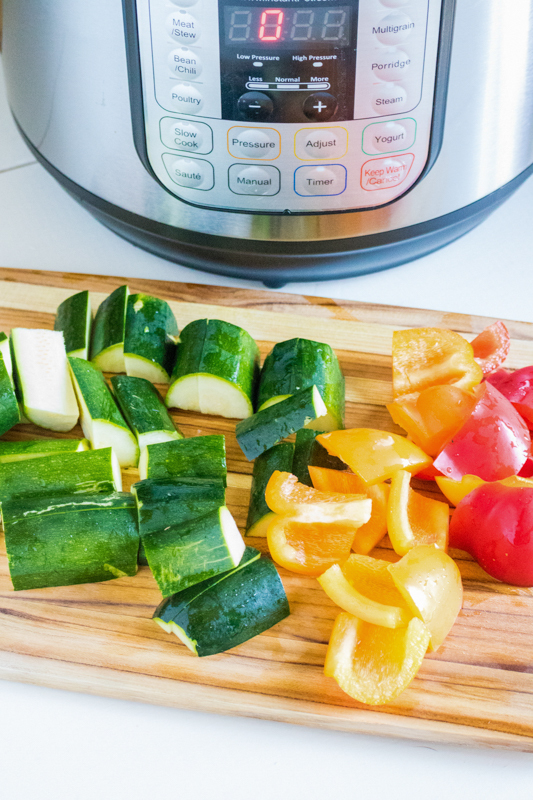 Try to chop all the veggies to a similar size, so they cook evenly in the instant pot. Next is the spice mix. 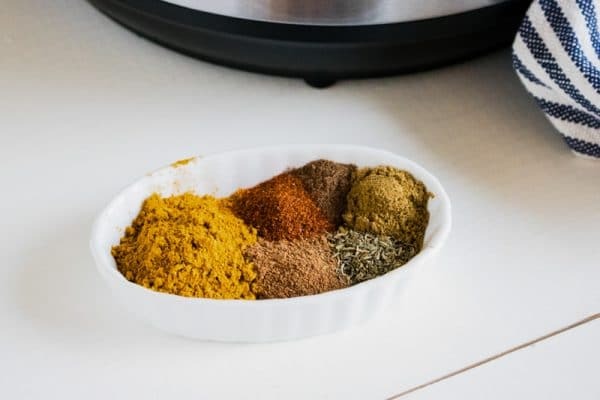 Most important is the curry powder – it’s worth investing in a good quality curry powder as a kitchen staple. We’ll also add salt, cayenne pepper, ground ginger, and ground cumin. You can always experiment with the spices to find the perfect combination for your taste. I’ve made versions with paprika, coriander, black pepper, or turmeric in the past. Be as creative as you want! 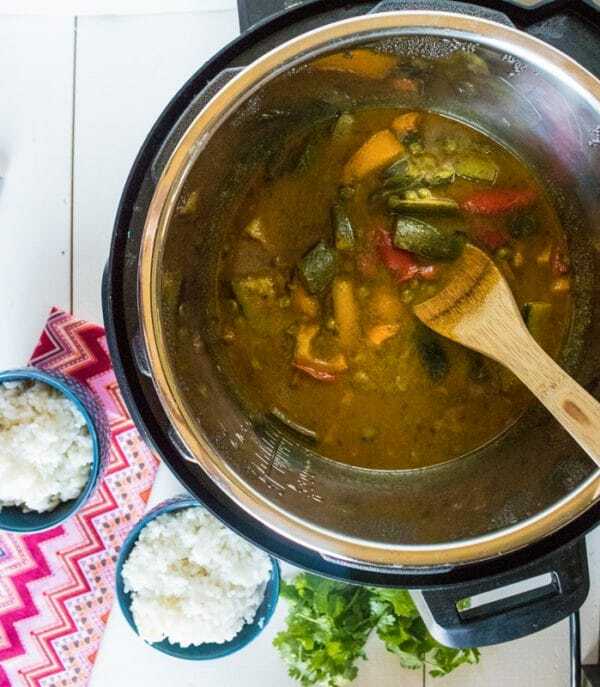 Then, just throw all your curry ingredients into the instant pot. I added some frozen peas as well, for a little extra texture and color. Just like the spices, you can play around with the vegetables for this curry. 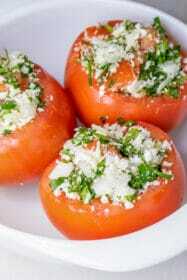 Try it with eggplant, beets, carrots. This is a good “pantry cleaning” recipe, because just about anything goes. Next, you’ll add the coconut cream and vegetable broth and stir all your ingredients together. 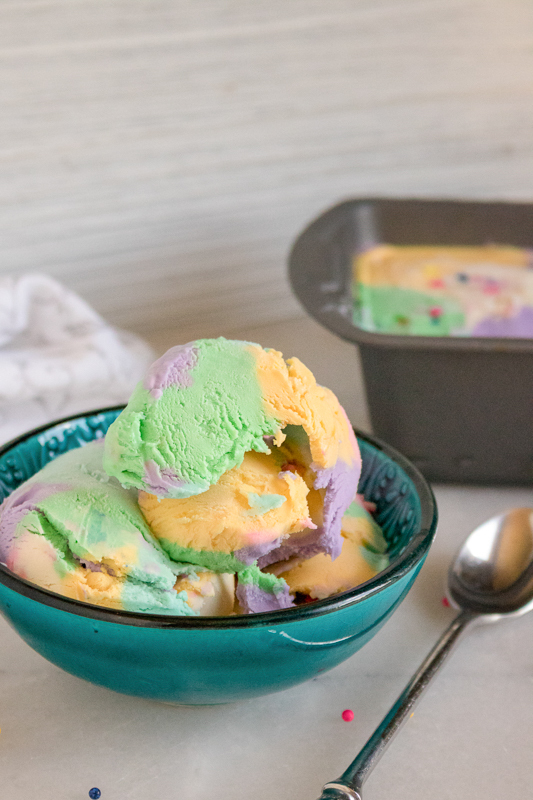 Note that I used coconut cream for this recipe, not coconut milk. The cream is much thicker and richer. You can substitute coconut milk if that’s easier to find – but the curry sauce will be thinner. And finally, seal the instant pot and set the pressure on high for 10 minutes. And that’s it – your vegetable curry will be done! Do a quick release when the pressure time has finished and stir it all together well. By now, your kitchen will smell like an Indian restaurant, alerting everyone that it’s time for a delicious dinner — and they didn’t even have to wait very long! Taste the curry before serving to see if the spice level suits you. If you need to kick it up a notch, stir in a bit of chili powder or sliced chili peppers to spice things up. Serve the vegetable curry over rice, with a sprinkle of fresh cilantro. If you need a cocktail to wash down your veggie curry, try a blood orangecello or some club soda mixed with strawberry-infused vodka. 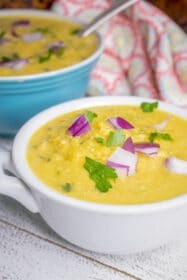 And if you like this recipe, be sure to check out my Butternut Squash Curry or Indian-Spiced Golden Curry. Yum! This instant pot vegetable curry is packed with Indian-inspired spices and loaded with fresh veggies. 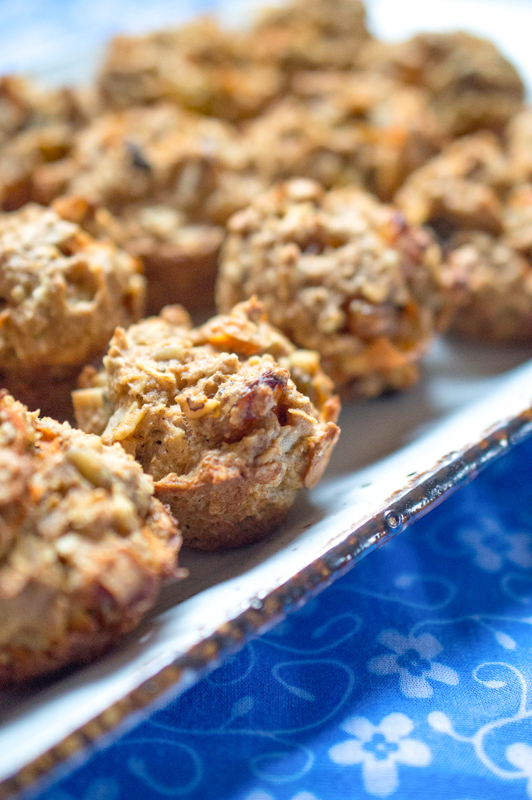 Plus, it's completely vegan, gluten-free, and cooks up in less than 20 minutes! Combine all ingredients in inner pot. Stir to combine. Turn pressure valve to sealing and set manual pressure on high for 10 minutes. Mix in a dash of cayenne pepper or sliced chili peppers to increase spice level, if desired. 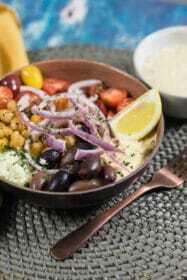 Serve over rice, garnished with fresh cilantro.